The Citizen Weather Observer Program (CWOP) is a public-private partnership with three goals: 1) to collect weather data contributed by citizens; 2) to make these data available for weather services and homeland security; and 3) to provide feedback to the data contributors so they have the tools to check and improve their data quality. In fact, the web address, wxqa.com, stands for weather quality assurance. 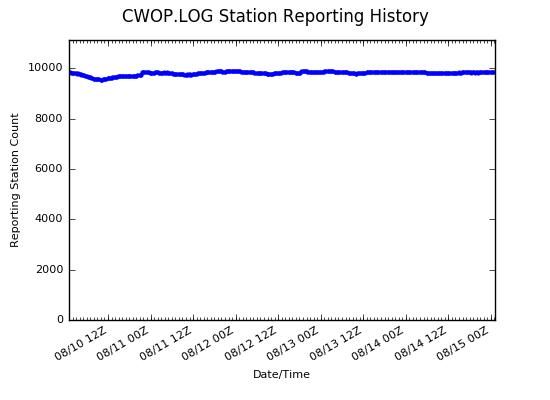 The number of North American CWOP stations sending data over the past several days is normally more than 7000 stations sending 50,000 to 75,000 observations every hour. The number of world-wide citizen weather stations sending data to CWOP is shown increasing over the past decade. Search CWOP Data Quality List Archives by keywords and phrases. Search CWOP Members List by ham, CW or DW callsign, NWS ID, town, or name. Page generated on Apr 24, 2014. Site maintained by CWOP Support. Send any comments to cwop-support at noaa dot gov.